BIRMINGHAM, England, Oct. 27, 2000 – Saleen/Allen Speedlab, five-time ETD Champion in sports car racing, announced today at the Birmingham Auto Show that Oliver Gavin, former Formula One test driver and British Formula 3 Champion, would be joining the team for the 2001 American Le Lemans Series (ALMS). Gavin will compete with 2000 Grand-A111 GTE) Co-Champions Terry Borcheller and Ron Johnson, as well as Tommy Kendall, the winningest sports car driver of all time, in the entire ALMS season. In addition, the Speedlab team will contest the classic endurance races at the Rolex 24 at Daytona and the 24 Hours of Le Mans. Like most young professional racers, Oliver Gavin has driven many different cars in many different series in his career, but few have had Olly’s success! Early in his career, Gavin received the prestigious McLaren Autosport “Young Driver of the Year” award from the late Ayrton Senna for winning 11 out of 12 races and the National Formula First Championship in 1991. The following year, Gavin was the runner up in 1992 British Vauxhall Lotus Championship with three wins and two fastest laps for the John Village Automotive Tearn. In 1993, Gavin moved up to the British Formula 3 Championship where he was again runner up with Edenbridge Racing winning five races with two poles and five fastest laps. After competing in the FIA Formula 3000 and Formula 3 Championships in 1994, Gavin finally broke through in 1995 with a. dominating season in the British Formula 3 Championship. Gavin was the British Formula 3 Champion with six victories, three poles and five fastest laps. For the next several years, Gavin participated in numerous series, including the 1995 FIA International Touring Car Championship with Opel Team Joest; the Porsche Cup from 1993-1999; and Formula One testing for McLaren and Benetton from 1997 through the 2000 season. He was also the Formula 1 Grand Prix safety car driver for the FIA from 1997 through 1999 and a commentator for Radio Le Mans twice. This past year, Gavin competed in the inaugural Grand American Road Racing Championship, driving Intersports Racing’s Lola Judd V10 in five races, including a second-place finish in the Grand-Am finale at Watkins Glen. Amazingly, he set the fastest lap in every session of the last two Grand-Am races drawing the attention of Saleen/Allen Speedlab’s principal, Steve Saleen. When not driving a new racecar, the 23-year-old Gavin enjoys personal fitness, mountain biking and most sports. He resides in Northamptonshire with his wife, Helen, and daughter, Lily. Fulfilling the promise of its appearance, Steve Saleen’s new S7 street supercar (AW, Sept. 25) is also going to come as a racer. Dubbed the S7R, the competition version will debut before the season ends Dec. 31 in Australia. Following single-car shakedown races at Laguna and Las Vegas, the factory’s Saleen-Allen team plans to campaign two cars for the entire 2001 ALMS season, plus the Daytona and Le Mans 24-hour enduros. Three drivers have been named so far: two-time SCCA Trans-Am champ Tom Kendall joins Terry Borcheller and Ron Johnson, winners of this year’s GTO title for Saleen-Allen. Kendall hasn’t raced regularly since 1997. Several private teams already have placed orders. Priced at $425,000, a mere fifty grand up on the street model, SR7s will be constructed both in England and at a new facility in Irvine, California. LAGUNA SECA, Calif., Oct. 15, 2000 – After debuting its new Saleen S7R at today’s GlobalCenter Sports Car Championship Presented by Honda, the Saleen/Allen Speedlab team feel confident that they have successfully benchmarked their racecar against the top competition in the American Le Mans Series (ALMS). 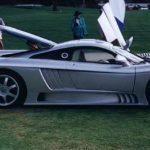 With the Saleen S&R’s inaugural race coming less than two months after the introduction of its sibling, the Saleen S7 road car, there was some apprehension about the racecar’s performance. 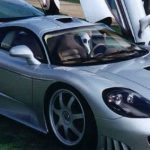 But in Friday’s first practice session, the Saleen S7R was competitive with the Dodge Vipers and Chevrolet Corvettes that have dominated the first ten rounds of the ALMS season. And in Saturday’s second and final qualifying session, the #55 BASF S7R qualified ahead of a Team Oreca Viper and was less than one second off the pace of the GTS pole-siting Corvette. With the green flag flying, Tommy Kendall set off after the two Corvette s and two Vipers, passed the #92 Dodge Viper and, at one point, set the third fastest lap in GTS. But the teething problems started at Lap 22 when the transmission became stuck in fifth gear and the team lost eight laps in. the pits. The question resonates like a church bell at high noon: Does the world need another supercar? If Steve Saleen is tugging the rope, the answer is listen. And watch. 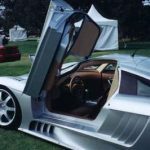 At Monterey in late August, we watched Saleen unveil the S7, his latest-and to date, grandest-effort in the specialty car manufacturing universe. 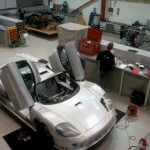 S7 is aeroslick and represents for Saleen the culmination of more than 17 years of car building and car racing efforts. The recipe for S7, while simple, is nonetheless ambitious: It bakes in tried and true manufacturing processes with robust performance hardware. 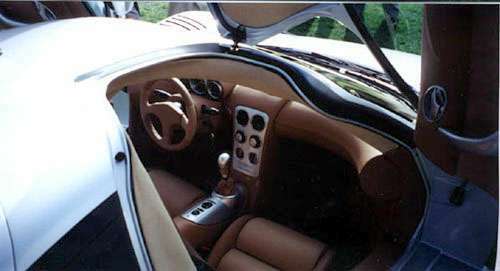 Its skin is wind-tunnel honed, its interior is a combination of utilitarian and exotic design. How well it runs is a question that must wait until the second quarter of next year when Saleen himself promises customer cars will be ready for delivery. Sign up today and be first on your block to get yours for $375,000. S7, Saleen touts, is going to be a supercar unlike any other. 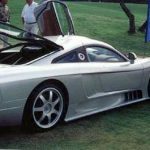 While that is an automotive mantra we’ve heard before-can you say Bricklin, DeLorean, Mosler, Weigert?-there are reasons to believe some of Saleen’s claims. What he says has a throw-weight behind it others did not. Take for example Saleen’s small-batch manufacturing experience as well as the ever-important financing courtesy of mega-busi-ness guru Tony Johnson, head of Hidden Creek Industries, a $6.5 billion company. That Steve himself asserts that S7 will have performance superior to that of the upcoming Mercedes Vision SLR supercar is reason enough to raise hackles of skepticism. That he plans to charge half again the price of the SLR’s reported $250,000 for his car leaves us flat dumbstruck. Still, admire his chutzpah. The S7 is so named for a combination of Saleen and the car’s 7.0-liter powerplant displacement. Though targeted at a highly rarefied market, its genesis is aimed at driving home a much larger point: That Saleen does not make “tuner” cars. Saleen tells all who’ll listen that he’s a specialty manufacturer who undertakes far greater effort and overcomes greater obstacles than those who merely bolt on fiber wings or pop in performance chips. Aside from completely stripping each car with which he begins the Saleen transformation, his company has learned to leap through state and federal regulatory hoops, create shop and owner manuals, establish a dealer network and provide customer warranties, to name just a few steps. These efforts go well beyond what tuners can and will do for customers; they are the efforts of carmakers. By the end of this year, Saleen will have built in his history a total of 8000 cars. His next-generation car, this car, starts with a simple tube-frame chassis and honeycomb construction, a basic layout with a long wheelbase and compact drivetrain that allows for a roomy interior. 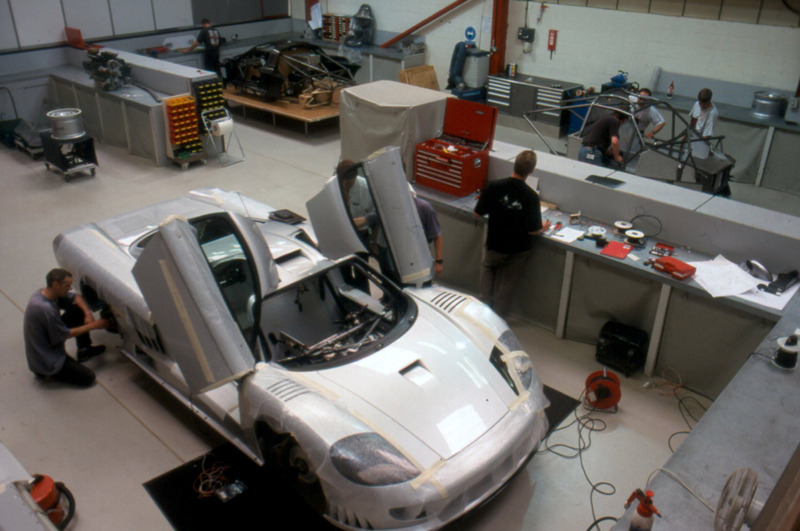 Saleen subcontracted chassis design and manufacture to Ray Mallock Ltd., a British firm that specializes in building race-winning touring cars. Reasons for dishing out the chassis were many. First, RML knows racing; it has won multiple British Touring Car Championships-driver and constructor-in recent years. (No wonder S7’s chassis is something like you’d see in the sports car racing world.) Because it knows racing, it knows design, manufacturing speed and flexibility-keys to a project like this. As is the case with many race car builders, RML wants to grow outside its competition confines and into the “real” car world. 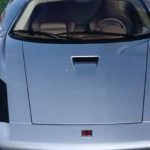 Finally, RML gives Saleen a ready-made European delivery outlet for these cars; Saleen plans to have S7 sold worldwide, and as such it has been engineered with both left- and right-hand-drive models. RML will supply Saleen with a complete chassis and suspension with uprights, parts that are broken down and air-freighted to Saleen’s Irvine, California, manufacturing center. Once in California, Saleen will drop in a Ford 7.0-liter, all-aluminum 427 engine mated to a six-speed ZF transaxle. As for performance, well, Saleen makes super claims: The S7’s 550-horsepower engine will move it to 60 mph from a standing start in less than four seconds, with a top speed in excess of 200 mph. “The drivetrain is a derivative of both our racing and production knowledge that we’ve gained over 17 years,” Saleen says. The S7’s interior can best be described as spartan elegant. Spread throughout is Connolly leather and suedes, brushed aluminum touch pieces and ever popular “jewel-like” gauges. According to Saleen, the effort is “to put a premium on the cockpit without compromising performance.” If you have a chance to sit in an S7, you’ll notice the cabin is slightly asymmetrical. 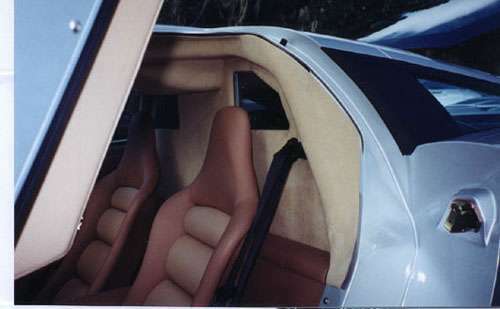 The effect is to have the driver sit more inboard. But once in S7, you’re there. “If you’re looking for ease of entry and exit, you may want to get a [Ford] Focus,” says Saleen with a chuckle, and adds that “once in the car, you’ll be well wrapped.” Call it a nod to its racing heritage, but S7 has a removable steering wheel that clearly aids getting in and out. A rooftop scoop forces cooling air into the engine, which may be key for performance cars, but does little to increase rearward visibility. To that end, Saleen incorporates a rearward-mounted television camera and couples it to an in-dash monitor that gives the driver a clear view of what evil may lie behind S7. As for its exterior design, it was a semi-collaborative effort between Saleen himself and longtime Saleen designer Phil Frank. Still, the absolute shape is the result of many hours working with a one-third-scale model in a rolling plane wind tunnel. Obviously, not an inexpensive undertaking, but one Saleen sees as paramount to making S7 both visually rakish and stable at high speeds. Saleen sees S7’s competition measured two ways: price and performance. Naturally, less-expensive supercars are the Lamborghini Diablo, Jaguar XJ220, Lotus, Porsche and some Ferraris. Additionally, he points to the aged McLaren F1, a $1 million technological toy, as the kind of car his might run for pinks. Saleen sees a three- to four-year production run for S7 with a total of 300 to 400 built for world-wide sale. Among his targeted buyers are newly rich e-commerce mavens, but he’ll gladly sell to anyone with the cash. “The car is built with a big frame, and that will allow for the professional athlete and that level of demographic,” he says. S7 will not be able to push aside its racing heritage. Eventually it will make its way to competition on the racetrack in sports car racing-the arena where Saleen feels most at home. When Steve talks, he shifts between the first and third person. The effect is disconcerting, but what to do if your name is on the car? “The total concept is 100 percent Saleen. We wanted to do a high-performance, worldwide vehicle. Sorry to disappoint, Steve, but proof of the status you seek comes later, when and if the current iteration of Saleen is still in business, having made enough money to tool up and manufacture the car that comes after S7. It’s good to have deep pockets when you want to sell a $375,000 car. 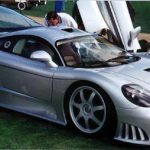 That’s why Steve Saleen said he is happy to have industrialist S.C. “Tony” Johnson as a partner in his Saleen Inc. of Irvine. For more than a decade, Saleen’s company has bought Mustangs from Ford Motor Co., souped them up and turned them over to dealers who sell them as big-ticket toys to wealthy speed demons. 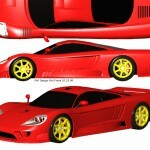 Now Saleen is crafting from scratch a car of his own that he hopes will rival the Ferrari and Lamborghini. While Saleen’ s Mustangs go for $30,000 to $50,000 apiece, the asking price for his new S7 is nearly $400,000. Johnson is the president and chief executive of Minneapolis-based Hidden Creek Industries, a holding company specializing in the automotive industry. Hidden Creek counts about $6 billion in annual revenue from portfolio companies such as Dura Automotive Systems Inc., Tower Automotive Inc. and J.L. French Automotive Castings Inc. Johnson’s companies make engine components, windows, doors and other auto pans. 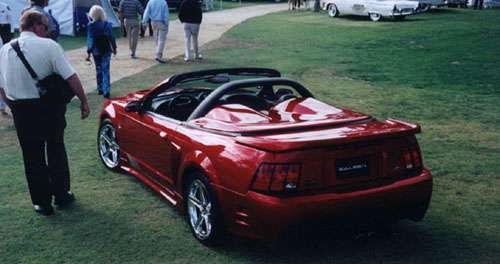 Johnson became an investor and partner in Saleen Inc. in 1993. Saleen, the company’s founder, president and a former professional race car driver, said he needed some capital to help the company out after recession a decade ago. “To withstand for a longer time, I needed to have better capitalization,” Saleen said. Saleen didn’t have to look beyond his own client list. Johnson is a car enthusiast and bought a Saleen Mustang in the early ’90s. When the time came to make a deal, Saleen chose Johnson, who now serves as Saleen Inc.’s chairman. “We are fifty-fifty partners,” Saleen said. The Saleen Mustang is a high-performance version of the Ford sports car. The Saleen version has more horsepower, a racing suspension, new body trim and other custom pans. Saleen Inc. is considered a specialty vehicle maker under federal government guidelines and has put more than 7,000 vehicles on the road to date. The company is 10 months into the development of its new S7, a 550-horsepower supercar. Saleen said. 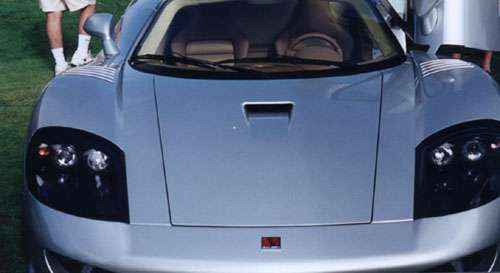 Saleen designed the car with Phil Frank, a longtime product designer and consultant. 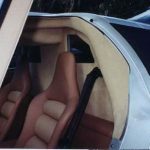 The company used Ray Mallich Ltd., an English automotive company, to develop the car’ s chassis and recruited the University of Glasgow in Scotland to handle the car’s aerodynamics. 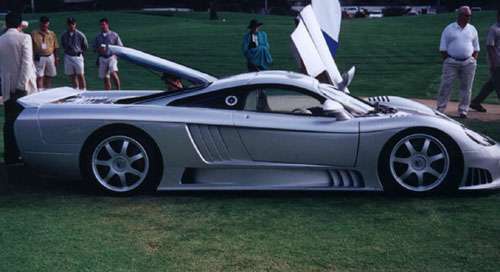 Unlike the development process for most cars, Saleen skipped the clay model step and went straight from computer-aided drawing into production. A number of manufacturers are interested in how he developed the car, he said, since skipping the clay model brought down the cost. “It saved time and money,” Saleen said. Saleen’s bid to make his own car grow out of his 16 years of bolstering Mustangs. 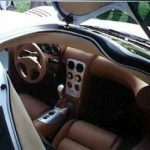 Saleen Inc. designs, develops and makes a specialty product line with 2,000 performance and custom automotive products ranging from engine components and body pieces to floor mats and speedometers. 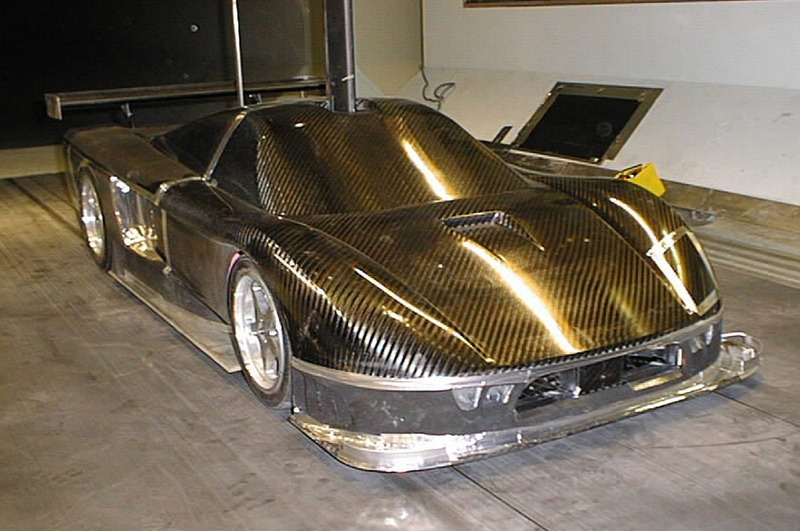 For the body of the S7, Saleen incorporated the carbon fiber technology used in the Formula One race cars. The S7 was unveiled last month at a car race in Monterey, Calif.
Saleen now is testing the vehicle for proper engine function and throttle response as well as the temperature and cooling systems. It will start speed tests this month and should finish testing by the end of the year, he said. Saleen will produce about 100 cars per year and they will be on select showroom floors in the second quarter of 2001. As for the demand for the S7, Saleen already has orders for eight cars, he said. Demand is “a lot higher than anticipated,” Saleen said. Saleen said he expects to produce and sell 300 to 400 of the cars in the next four years. The S7 will also be sold in 15 exotic car dealerships around the nation, he said. All of the manufacturing and tooling of the vehicle is being done in Irvine, but to do so, the company needs more space, Saleen said. It is currently looking for a 125,000-square-foot facility in Irvine to consolidate its six facilities. It has two buildings in Lake Forest, two in Huntington Beach and two in Irvine, including its headquarters, assembly line and showroom. The main building also houses the design and engineering operations as well as the customer service center and parts distribution facility. “Irvine has turned into Detroit West,” Saleen said. Orange County is now home to the headquarters for 10 automotive brands, while Los Angeles boasts a few carmakers as well. The move will come at the end of the company’s lease in March and will give Saleen Inc. about 25,000 more square feet of space. Saleen has 115 employees, a number that won’t change much when the full-scale production of the S7 begins. Saleen said the current staff can handle most of the work. The company’s operations produce five Saleen Mustangs per day. Saleen has made a few hundred performance Ford Explorers and a few Ford Contours. Saleen also made a performance minivan out of a Ford Windstar for comedian Tim Allen. “We’ve done a number of items for him,” Saleen said. Allen is a racing enthusiast. The star of “The Santa Clause” is a partner with Saleen in Saleen/Allan Speedlab, a racing team and development division of Saleen Inc.
Editor Note… From our friends at MustangWorld.com. 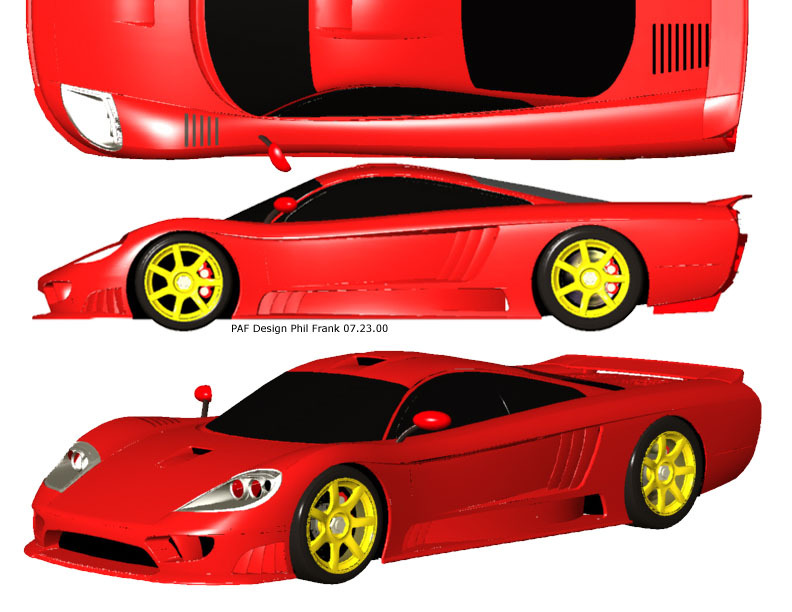 Aug. 20–Specialty-vehicle builder Steve Saleen will expand his business next year with the production of a $375,000 supercar intended to challenge Ferrari, Lamborghini and Jaguar. 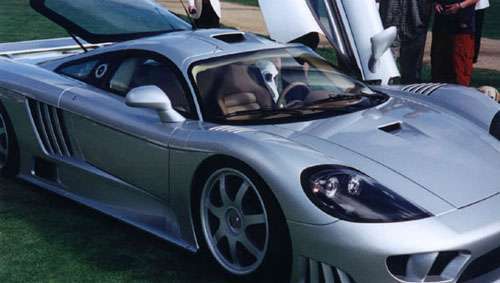 Saleen was to unveil the prototype of the Saleen S7 at the Monterey Historic Races Saturday. He eventually hopes to build 100 of the 550-horsepower road rockets each year at a new factory in Irvine. “Part of the American dream for every kid is to build your own car. I’m fortunate in that I’m in a position to realize that dream,” Saleen said in an interview. Some might call him a tuner, but Saleen prefers the term manufacturer. In the past 17 years, he has built more than 7,000 high-performance Mustangs. He does this by stripping factory-fresh cars and reconstructing them with bigger brakes, more powerful engines and race suspensions, among other improvements. The Saleen Mustangs sell for $33,000 to $75,000. The S7 is a quantum leap forward. The car will be based on a Saleen-built chassis with a body built of carbon fiber, an aerospace material similar to, but many times stronger than, fiberglass. The engine will be a 7.0-liter aluminum V-8 mounted behind the driver mid-engine in sports-car parlance. 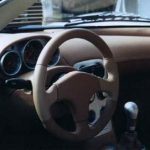 The car will feature leather on every interior surface and a built-in camera and video screen for better rear vision. “We are basically building our own car from the ground up,” Saleen said. Building your own supercar is a risky and expensive venture, a lesson many automotive entrepreneurs have learned the hard way. 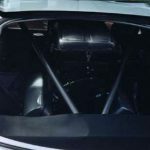 Gerry Wiegert, builder of the much-heralded 600-horsepower Vector sports car, ran out of capital in the 1980s after building fewer than 15 cars. Even Carroll Shelby, who built the legendary Cobra sports cars of the 1960s, has run into trouble with his latest project, an Oldsmobile V8-powered supercar called the Shelby Series 1. After taking deposits from dozens of buyers, Shelby had to tell them the car would be months later than expected and cost $25,000 more than first promised. Saleen has one asset these other builders didn’t have: a substantial line of capital from his silent partner, auto-parts millionaire Tony Johnson, who is the chairman of Dura Automotive Systems and Hidden Creek Industries of Minneapolis. “Saleen certainly has the financing behind him to make this project happen,” said Gordon Wangers, managing partner of Automotive Marketing Consultants Inc. of Vista. Saleen promises it will be. With a weight estimated at 2,700 pounds, Saleen promises that the car will accelerate to 60 mph in less than 4 seconds and complete a quarter-mile in 11 seconds. The cars will be sold through the 75 Ford franchises already certified as Saleen dealers, plus 15 new exotic-car dealers that Saleen is recruiting. Saleen, whose 150 employees are headquartered in Irvine, plans to move to a larger factory by early next year. 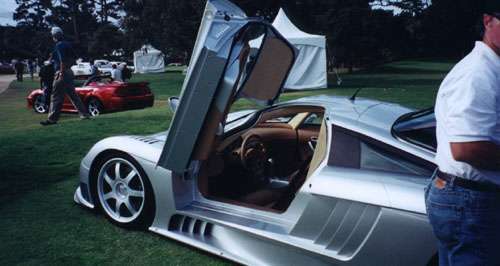 IRVINE, Calif. — The Saleen S7, unveiled at the 2000 Monterey Historic Races, is an American supercar. Like most things American, the S7 has its roots in other parts of the world, as the internationally known specialty vehicle manufacturer searched the world over for top components for its new vehicle. 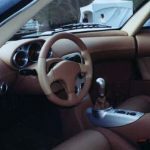 For example, the 2001 S7 utilizes world leading Brembo supplied brakes from Italy, a Ray Mallock, Ltd (RML) chassis, and numerous elements from suppliers in the Midlands area of the United Kingdom, a region that is to motorsports what the Silicon Valley is to the world of computers. Adding to the international flavor, the S7 was wind tunnel tested at the University of Glasgow in Scotland. 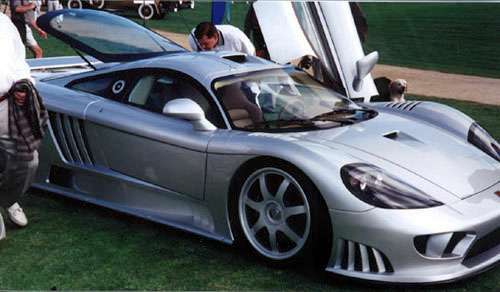 Saleen selected RML to assist with engineering and design work for the Saleen S7, the first joint venture between the companies, because of their outstanding chassis and suspension reputation. 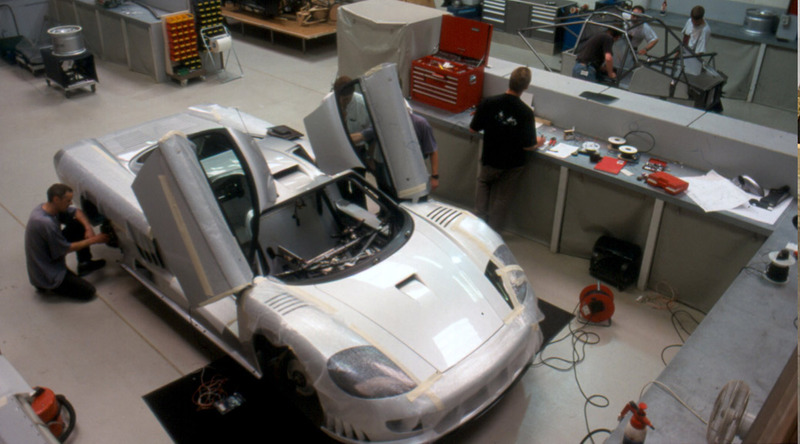 The pre-production chassis and body were constructed at RML’s facilities in Wellingborough, England, while the final assembly of the prototype car took place at Saleen’s facility in Irvine, Calif. The two companies have entered into an agreement to work together on the development of cars for both street and race use. IRVINE, Calif. — The S7, built by Saleen, internationally known specialty vehicle manufacturer, features blinding performance, attention-grabbing exterior design, and space-age aerodynamics. That same flair is evident in the S7’s interior, mixing luxury with functionality in the driver-friendly cockpit. From its plush Connolly leather covered interior surfaces, to adjustable pedals and a removable steering wheel, driver comfort is a priority of the S7. 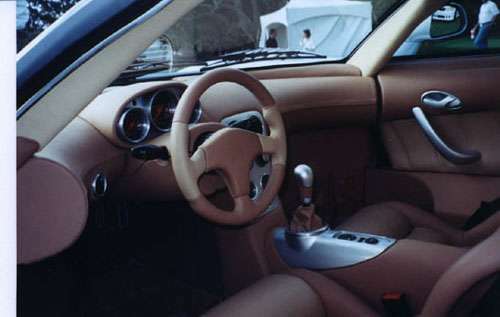 The movable pedals and detachable steering wheel make the S7 more suitable for taller drivers than other supercars, and allow for easier entry and exit from the vehicle. 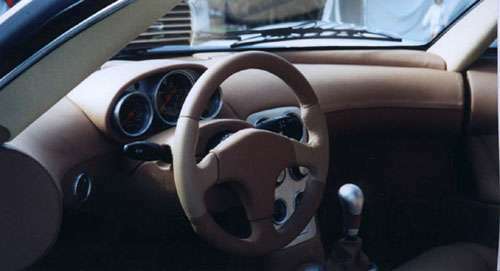 In the asymmetrical cockpit, the driver’s seat is subtly moved toward the center of the cabin, enough to increase the driver’s position and visibility. This enhanced seat position contributes to an improved center of gravity and better weight distribution. Weight distribution is also a factor in the storage compartments. 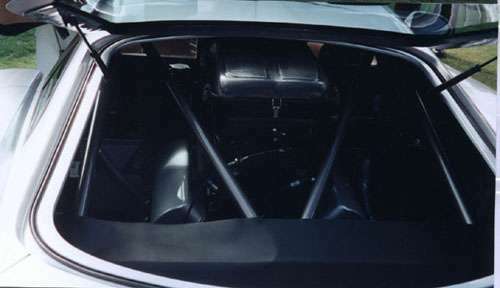 With a mid-chassis engine location, the S7 features a trunk in the front and rear of the vehicle. The S7 comes equipped with custom-fit luggage for use on long trips. The culmination of the interior sophistication is a unique video rearview “mirror,” utilizing a rear-mounted video camera and liquid crystal display (LCD) located where a traditional rearview mirror would be, near the top-center of the windshield. The powered side mirrors are mounted on pillars. Traditional creature comforts included on the S7 are power windows and locks, as well as air conditioning. An AM/FM audio system with 6-disc CD player is standard. The instrument panel features easy-to-read analog gauges and center-mounted tachometer. Interior accents are brushed aluminum with body-color highlights. IRVINE, Calif. — There’s something about a supercar that’s different – sensuous lines, scoops and wings, an aerodynamic purposefulness that sets these cars apart. Supercar design traits must combine form and function in order to permit stable speeds in excess of 200 mph while also pleasing the eye. The all-new Saleen S7 meets both challenges. 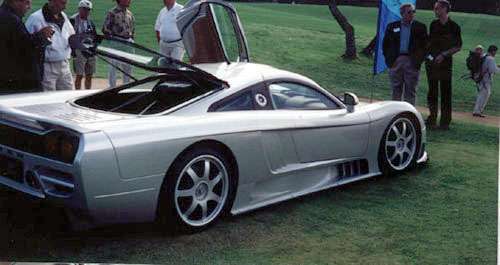 Phil Frank, a long-time design consultant with Saleen, penned the S7’s body, using computer-aided drawing techniques. 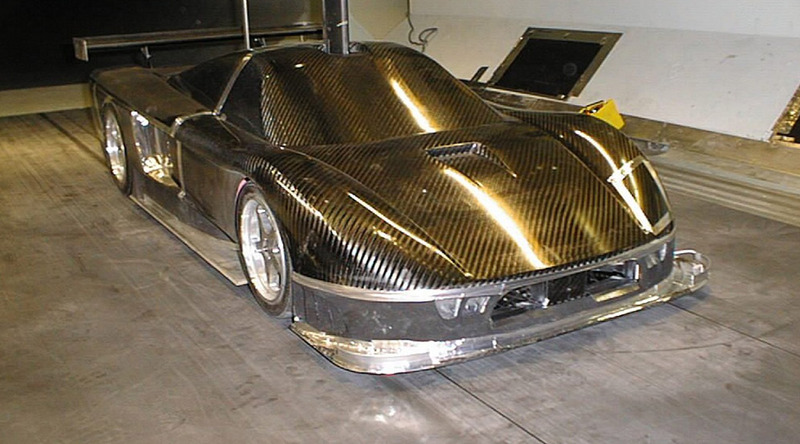 Saleen, Inc. and famed British racing house Ray Mallock, Ltd. used extensive work in a wind tunnel to add superior aerodynamics to the finished skin. The S7’s shape says “supercar” but the overall design is distinctive and not derivative of any other car. The drag to lift ratio, center of gravity, co-efficient of drag and the downforce generated by the S7’s body were all considered as part of the refinements produced in the wind tunnel. Full underside aerodynamics help reduce turbulence below the body and improve overall stability at high speed. 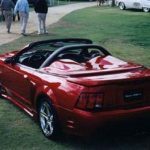 Traditional Saleen design signatures – like functional gills and fascia openings –provide cooling and are integrated to also provide superior airflow around, through and under the car. Example: Side scoops help cool the transmission while split radiators exhaust under the car and to the sides to create additional down force. The Saleen S7’s shape provides arguably the best overall aerodynamics of any production car ever built. 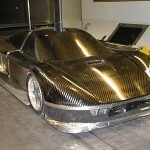 The team selected an autoclaved composite body over a space frame chassis with honeycomb reinforcement. By using the carbon-fiber composite, a significant weight reduction was possible while providing increased strength over steel. The S7’s doors open up and away from the body, another distinctive feature designed into the car as part of its supercar pedigree. A unique and functional roof intake system feeds air to the engine, while a nose scoop supplies high volume flow-through cabin ventilation. Electrically controlled side mirrors extend on pillars to provide optimum utility. Covered projector beam headlights meet worldwide regulations.